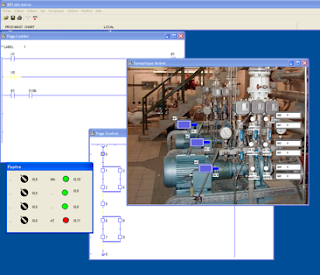 APIsim is a free software allowing the simulation of an automated system. It functions as a software / PLC set. The language part is used to describe the operation of the system in the ladder language (or scale diagram) or in the Grafcet language. an information coming from real sensors and Send orders to the actuators. The animated mimic, communicating with the program, makes it possible to validate the functioning of the system. The synoptics are described as editable text files. Several types of objects are available, door, barriers, tray, jacks, etc. It is possible to connect a port or usb I / O card.